For a true boutique experience this 8-bedroom residence offers contemporary design and luxury in an interior space of 456 square meters or approximately 4,908 square feet and features six bedrooms within the house as well as two independently accessed guest rooms. We now also offer the option of booking the two villas as one. That is “the estate”. Two of the most exclusive properties available in Crete, these stunning contemporary residences offer panoramic views of magnificent sunrises and sunsets against backdrops of the Mediterranean sea and the Cretan landscape. The architecture, sophisticated furnishings and beauty of the surroundings combine to make these villas unique. Situated on a gentle hillside overlooking the sea, the site is surrounded by handmade stone walls. It contains mature gardens with numerous olive trees, flowers and other Cretan / Mediterranean vegetation. The villas are approached via a stone paved road with plants between lit rocks along the side and a small stone bridge that leads into welcoming stone paved entry courtyards, shaded by olive trees and coloured by flowers. The villas feature impressive living areas that include large open plan living rooms with high ceilings and fireplaces. There are studies and dining areas opening through French doors to the pool areas, with views to the infinity edge pools and surrounding gardens. Well equipped kitchens open onto outdoor, pergola shaded poolside dining areas and wide patios, creating ideal spaces for alfresco living, dining and relaxing. Architectural features include exposed stone walls, beautiful natural hardwood floors in the bedrooms, marble and stone floors in the rest of the spaces, framed views, stone paved paths through the vegetation, exterior hideaways and kiosks blended into the surroundings. The land of 13,700 square meters or 1.37 hectares, has been professionally landscaped with terraced gardens featuring olive trees, colorful flowers, and aromatic herbs including thyme, rosemary, coriander, anise, mint, lavender etc... Stone paved foot paths take you through the gardens, with great respect to the land and nature. Garden pavilions take advantage of the wonderful views. 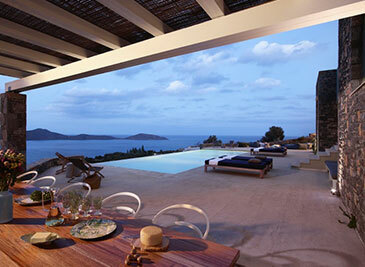 Broad terraces with built-in seating areas that surround the pools and the villas, offer magical views. The stunning infinity-edge pools create the impression that the water extends to the Mediterranean. The properties benefit from a very convenient setting on a quiet hill side with a few villas, yet they are only three km from the town of Elounda and seven km from the town of Agios Nikolaos, with their traditional taverns, gourmet restaurants, shops and night life. These two towns provide also marinas for yacht mooring with all services. There is now a Horse back riding Service at the village of Fourni (25 min drive) where one can take lessons outdoors or just a tour to experience the picturesque village, the pathways through the olive trees or even a gorgeous sunset through the mountains of Lasithi.